In the United Kingdom, all vehicles over three years old must have an annual mandatory MOT test to determine their road worthiness, safety and exhaust emissions for use on public roads. VOSA (Vehicle and Operator Services Agency) is the government agency that issues MOT test certificates. VOSA has licensed and authorized almost 20,000 car servicing and local repair garages around the country to carry out MOT testing. 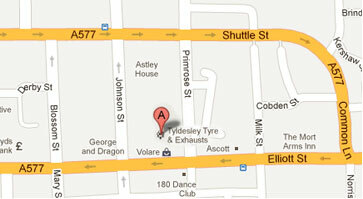 Tyldesley Tyres & Exhausts are your Tyldesley based MOT testing centre. The MOT certificate verifies that your vehicle meets the minimum acceptable environmental and road safety standards, at the time of testing, through numerous tests that are conducted as listed below, but without dismantling it. However, an MOT certificate does not confirm the road worthiness of the vehicle. The certificate cannot be taken as a substitute for the mechanical maintenance of your vehicle. Some areas are excluded from the test. These are clutch, gearbox and engine. The MOT test checks the important components and systems on your vehicle to ensure they comply with the minimum set requirements by law. You can view the VOSA detailed Inspection manual at the MOT test centre. These details are also provided in the leaflets published by VOSA. These parts must be free from damage or heavy corrosion in specified locations. Sharp edges are not allowed as they can cause injury. Towbars are important for security. These parts must be in good condition without improper alterations or repairs. The 13 pin electrical socket, speedometer and engine mountings should be in acceptable condition and should work properly. The brakes should be in good condition without modifications or inappropriate repairs and must pass the recommended performance tests. The test does not involve taking off the road wheels and trims. The tests incorporate examining the ABS or ESC (electronic stability control) where fitted. Checking is done for MIL for ABS, ESC, electronic park brake and the brake fluid warning system. It should latch effectively when it is closed. Securely latch on closing. It should be possible to open the front doors from the inside as well as the outside. Rear doors should be open-able from the outside. Check hinges and catches in doors for the right condition and functioning. The vehicle should be within the applicable limits for exhaust emission according to the type of fuel and age of the vehicle. Complete. Secure and without leaks. Not overly noisy. Is a catalyst missing or malfunctioning where one was fitted as standard. Fuel cap must fasten and seal the tank securely; it is opened and checked with the vehicle key. Pipes and hoses must be secure and in good shape. It should be of acceptable type and work correctly. The condition and operation of LED and HID lamps, level, secure fixing and being clean. The headlamp focus and main beam warning light are also tested. The vehicle must have the minimum number of mirrors required in secure and good condition. It must be properly fixed and have specified letters and numbers in the correct form, shape and colour and must be clearly visible. All the required seat belts must be in good condition and work securely. They are checked for the proper operation of pre-tensioners and MIL (malfunction indicator lamp) for air bags. The driver’s seat should be adjustable. All seat backs must be securely adjustable in the upright position. Condition must be good. Steering oil level. Any repairs and modifications undertaken previously should be suitable and proper. The steering pipes and hoses should be free from corrosion. The MIL for electronic power steering and the steering lock should function properly. The tyre type, size, and tread depths are checked and need to be proper and in suitable condition. Any spare tyres are not inspected. The vehicles used on after 1st January, 2012, for the first time, will be checked for MIL that monitors the tyre pressure. The vehicles first used from 1st August, 1980 onwards bear a unique VIN. This is not applicable for vehicles with multi-stage build. These must function flawlessly to provide a clear view for the driver. It must be clear and without any obstruction for viewing the road. 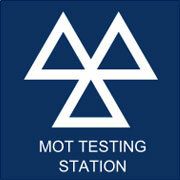 MOT testing centres have specified test bays. All equipment required for testing is available with the centres. All MOT testers are trained by VOSA and their MOT test reports are checked regularly. If your vehicle fails the test, you will receive a VT30 failure note. Some items might not have failed; they are mentioned as advisory items. You can watch your vehicle as it undergoes the MOT test from a specified place, but you are not permitted to disturb the inspector. Tyldesley Tyres & Exhausts are authorised by the VOSA to undertake MOT tests and we have a fully equipped testing bay and expert staff ready to test your vehicle. Just give us a quick call 01942 875 788 or complete our simple contact form to book your vehicle in and we’ll do the rest.